Like and share on our Facebook page and Tweet everyday for more chances to win! Enter our Summer Fun Giveaway from July 1 through July 31 to win the Imarku Pro Kitchen 8-inch Chef’s Knife, model number SC10-01. It is made of high carbon 7Cr17 stainless-steel and ergonomically designed to fit and feel great in your hand. One (1) winner will be chosen at random. 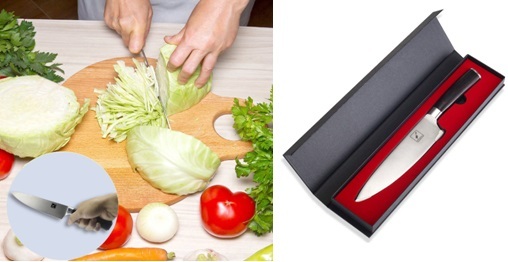 You will be notified by email with instructions for receiving this knife and pay no shipping costs sent from Amazon.com—a $30 value! The blade is 8-inches with the handle being 5-inches for an overall length of 13-inches. It is tarnish and corrosion resistant with 16 to 18% chrome in the blade to give it that glossy shine. The blade is 2 mm (0.08-inches) thick. The handle is made from exotic pakka African wood. It weighs about 8.2-8.5 ounces. Use it to cut summer watermelons and cantaloupes. It’s perfect to cut, chop, dice, and slice vegetables and fruits and will remove meat from bones but will not cut bones. Wash the knife by hand. Dishwashers ruin all knives! It does not come with a knife sheath, but a storage box. It is made in Solingen, Germany. Simply complete the form with your email and other information required. Be sure to “Like” and “Share” on Facebook too! Good luck and enter as many times as you want from July 1 through July 31. The more times you enter, the better your chances will be to win. Tell all your friends to enter as well on Facebook and on social networks to own this great knife. Be sure to “Like” and “Share” on Facebook too!